Isabelle and Jean-Michel Mangeot met while both worked for Michelin. 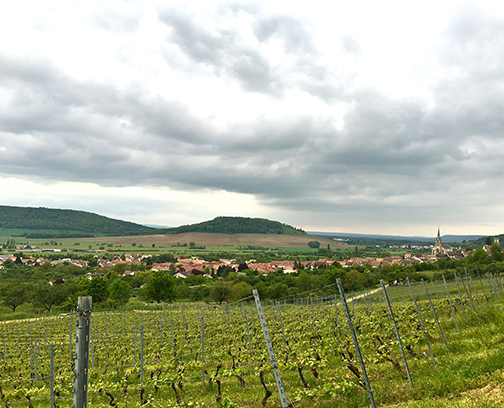 Many of their early conversations dealt with wine, and when the opportunity came up to help a 77 year-old family friend that had 3 ½ hectares in the Cotes de Toul, the couple sprung to action. 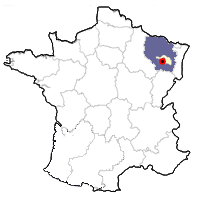 The friend eventually rented the couple 1 ¾ hectares in 1997 from which they grew grapes and sold them to the coop. In 2000, the farmer’s wife died and he decided to sell the rest of his vineyards to the Mangeots. Since that time they purchased farm equipment, winemaking equipment and a house that they renovated. 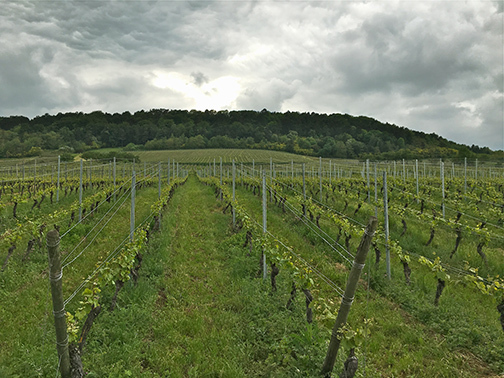 In addition, they built a humble winery and slowly expanded their holdings to 14 hectares of vines planted with Gamay, Pinot Noir and Auxerrois. Jean-Michel left his position at Michelin in 2005 and Isabelle in 2009. Many of the vineyards needed to be replanted, and this arduous work is now complete. 5 ½ hectares of land were also purchased at the end of 2013 which will be planted little by little over the next half a decade. 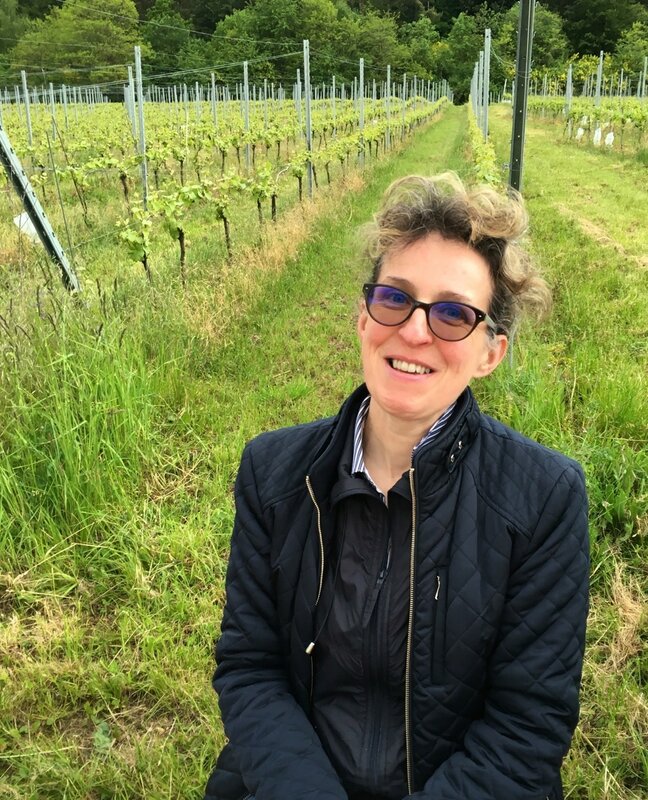 Unfortunately, Jean-Michel passed away in 2015 after a short battle with cancer: Isabelle now runs the domaine on her own, continuing the work that together they set out to do. All of the vines are farmed sustainably, so chemical treatments take place only when absolutely necessary. Every other row is plowed, while alternative rows are fully grassed. A green harvest is often undertaken in the summer to help limit yields and aid maturity. Harvest is strictly by hand. The wines are aged in fiberglass and temperature-controlled stainless-steel tanks with fermentation started with a pied de cuve. Both whites and reds are bottled after a light filtration. 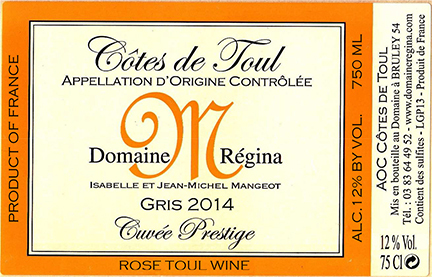 And, of course, Domaine Regina makes a wonderful version of the region’s most famous wine, Gris de Toul. 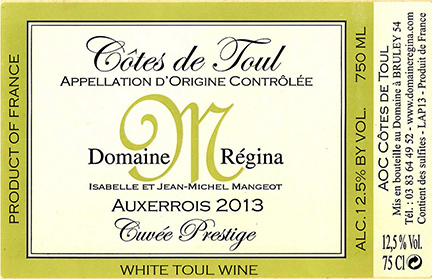 This wine is a blend of 85% Gamay and 15% Pinot Noir from 30 year-old vines with a yield of 50 hl/ha. The vines are on mostly clay and silt soils. The wine is aged sur lie for 3 months with no malolactic fermentation. Its alcohol is just 11.8% and it has 4 grams of residual sugar. This wine is directly pressed, with no skin contact—only the time during pressing gives the wine its appealing pale salmon pink color. The wine has notes of strawberry and powdery chalk, with a round mouthfeel and crisp acidity on the finish.